The winners of the 23 rd Annual Communicator Awards have officially been announced by the Academy of Interactive and Visual Arts and we are one of them, not once but twice. 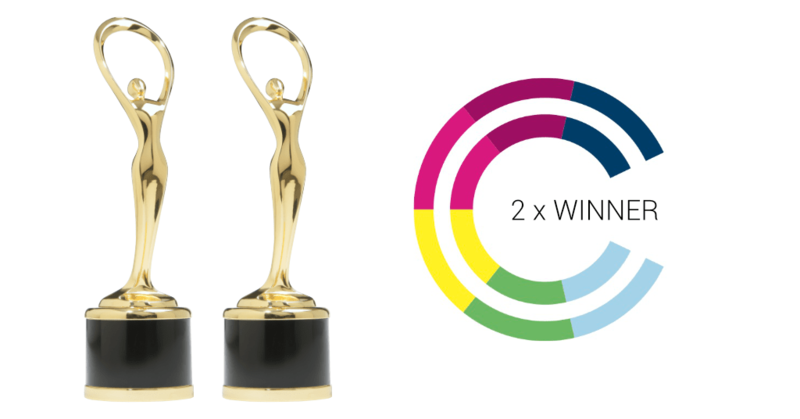 We have won two Gold - Excellence Awards for our Myriad Website we designed and built for Boss Design Group. With over 6,000 entries received from across the US and around the world, the Communicator Awards is the largest and most competitive awards program honouring creative excellence for communications professionals. The Communicator Awards are judged and overseen by the Academy of Interactive and Visual Arts (AIVA), a 600+ member organisation of leading professionals from various disciplines of the visual arts dedicated to embracing progress and the evolving nature of traditional and interactive media. Current AIVA membership represents a "Who's Who" of acclaimed media, advertising, and marketing firms including: AirType Studio, Condè Nast, Disney, Keller Crescent, Lockheed Martin, Monster.com, MTV, rabble+rouser, Time Inc., Tribal DDB, Yahoo!, and many others. To have won not one but two Excellence Awards in a field as competitive as this and judged by some of the industries top talent is an incredible achievement for the team.